Hydrogen Bonds: Glue or Grease? Hydrogen bonds are widely present in many substances and are responsible for defining the three-dimensional structures of proteins, the unusual physical properties of water and ice, and are found in many geologically significant minerals. The balance between hydrogen bonds and other kinds of interatomic forces can have significant effects on a mineral’s physical properties and polymorphism. For example, 1 wt. % H2O in some nominally anhydrous silicates that exist in Earth’s mantle has an effect on the shear modulus comparable to a temperature increase of 800-1000°C in the purely anhydrous mineral. The presence of a small amount of hydrogen within a nominally anhydrous crystal can affect the pressure and temperature of phase transitions, acting either as “lubricant,” lowering the transition threshold, or as “Velcro,” suppressing the transition. Current research in the area of hydrogen-bonded materials at high pressure is directed towards understanding the factors which cause hydrogen bonds to either promote or inhibit phase transitions, specifically the change from tetrahedral to octahedral coordination. 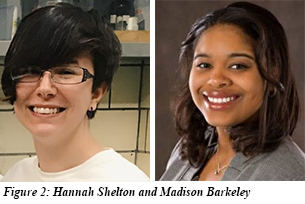 In new work by CDAC student Hannah Shelton (University of Hawai’i), former CDAC student Madison Barkley (University of Arizona, now at the Arizona Historical Society), and their advisors Przemek Dera (Hawai’i) and Bob Downs (Arizona) collaborating with Ronald Miletich at the University of Vienna, the high pressure behavior of Be(OH)2 (β-behoite) was investigated using single crystal x-ray diffraction. 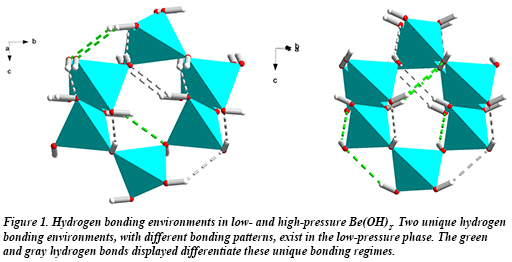 In Be(OH)2, the transition from the ambient β-behoite phase to the high-pressure orthorhombic γ-polymorph (Fig. 1) takes place between 1.7 and 3.6 GPa. This transition is essentially second order, is accompanied by a negligible volume discontinuity, and exhibits both displacive and reversible character. At ambient pressure, SiO2 (α-cristobalite) and ε-Zn(OH)2 (wülfingite), have the same topology of vertex-sharing tetrahedra as that of Be(OH)2, and the three materials undergo displacive phase transitions at similar pressures. Each transition, however, is characterized by a different mechanism, resulting in vastly different structures at high pressure. A comparison of the high pressure structures of the three materials shows that in Be(OH)2, hydrogen bonds restrict tetrahedral rotations and force the high pressure phase to assume a higher symmetry that minimizes hydrogen bond strain [H. Shelton et al., Phys. Chem. Min. DOI 10.1007/s00269-016-0818-5 (2016)].